From a pullout on ME 3 about 0.5 miles south of the south end of The Tarn, Canon Brook Trail swings west around the south ridge of Dorr Mountain and climbs over the South Ridge of Cadillac Mountain to join Bubble and Jordan Ponds Path in the valley south of Bubble Pond. The trail provides access (via Bubble and Jordan Pond Path) to the Jordan Pond area, as well as to the trails leading north to Dorr and Cadillac mountains. From the road, the trail descends west to cross a beaver flowage, intersecting with Kane Path at 0.2 miles. Turn left (south) at the junction and follow the beaver flowage down through the valley. After a brief, sharp rise, the trail reaches a junction with Dorr South Ridge Trail, which diverges right at 0.9 miles. This trail diverges right from Canon Brook Trail. Dorr South Ridge Trail rises at a moderate grade over rocky ledges and through semi-open softwood forest. Views of Champlain and Cadillac mountains and the ocean are frequent during the ascent of the ridge to the summit, which is reached at 2.2 miles. 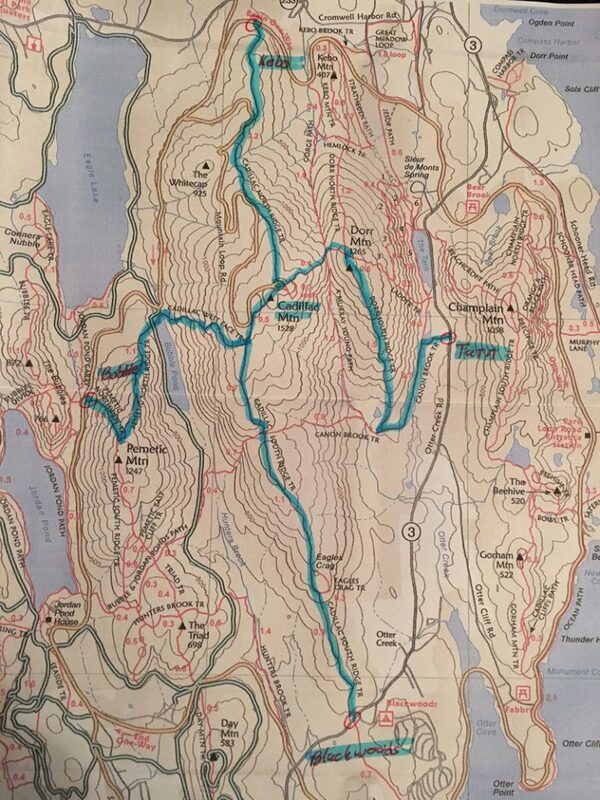 This short trail (only 0.2 miles) starts just north of the summit of Dorr Mountain and runs east to west, connecting Dorr North Ridge Trail with Gorge Path at its junction with A. Murray Young Path. At this intersection continue south-west 0.4 miles to the summit of Cadillac Mountain. Following the north ridge of Cadillac, this trail quickly rises through stunted softwoods onto open ledges. The trailhead is on Park Loop Road 0.3 miles east of where it becomes one-way. A pullout on the north side of the road provides very limited parking. The trail starts on the south side of the road and climbs steadily, always keeping to the east of Cadillac Summit Road, although the trail closely approaches road switchbacks on two occasions. For much of the distance, both sides of the ridge are visible. The views of Bar Harbor, Eagle Lake, Egg Rock and Dorr Mountain are excellent. This trail begins at Bubble Rock parking area, on the west side of Park Loop Road 1.1 miles south of Bubble Pond. The path enters the woods east of the road and climbs in almost constant cover. Sometimes following a rocky stream bed, the trail ends at a junction with Pemetic North Ridge Trail about 0.1 miles north of the summit. Feel free to detour toward Pematic Mountain summit for excellent views of the Jordan Pond, The Bubbles, Sargent Mountain and Eagle Lake. Return to junction of Pemetic Northwest Trail and Pemetic North Ridge Trail when finished. This trail descends from Pemetic Mountain summit towards the beginning of the West Face Trail of Cadillac Mountain. If group first summits Pemetic Mountain, return to the junction of Pemetic Northwest Trail and Pemetic North Ridge Trail before continuing down Pemetic North Ridge Trail for 1.0 miles. This trail is a quick descent through a forested area before crossing a carriage road near the Bubble Pond parking area at the north end of Bubble Pond. This steep trail is the shortest route to the summit of Cadillac Mountain. It is a difficult trail at any time, but especially in wet weather when the rock slabs can be extremely slippery. The trail begins where Park Loop Road passes north of Bubble Pond, using the short spur road off Park Loop Road to reach the pond, parking area and trailhead. The West Face Trail rises steeply through woods and over open ledges to a junction with Cadillac South Ridge Trail at 1.1 miles. Turn left (north) and climb steep slabs to reach the summit at 1.6 miles. A relatively long hike for Acadia, this trail starts on the North side of ME 3 about 50yds west of the entrance to Blackwoods campground. (A level 0.7-mile connector trail links the campground to the road and trailhead.) The trail climbs generally north. At 0.9 miles, a short loop trail on the right leads to Eagle Crag, with good views to the east and southeast. The loop trail rejoins the main trail in 0.3 miles. After leaving the woods, South Ridge Trail rises gently over open ledges to meet Canon Brook Trail at The Featherbed at 2.0 miles. Continuing in the open, South Ridge Trail reaches a junction with Cadillac West Face Trail on the left at 2.7 miles. Ahead, the trail passes close to a switchback in the Cadillac Summit Road and ends at Cadillac Mountain summit parking area at 3.2 miles.